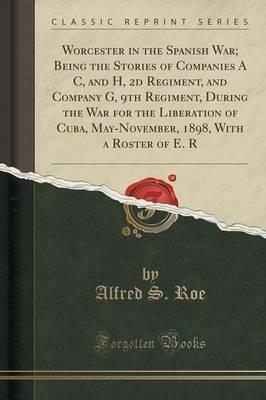 Excerpt from Worcester in the Spanish War; Being the Stories of Companies A C, and H, 2d Regiment, and Company G, 9th Regiment, During the War for the Liberation of Cuba, May-November, 1898, With a Roster of E. R In telling the deeds of those who served. One cannot suppress a feeling of regret for the others who had no chance. The war rumors were rife. No one thought it possible that Battery B would remain at home and have no part in those stirring times, yet such was the case. There had been very few left in the Battery ranks had not the men supposed that Massachusetts Artillery would be as necessary as Bay State Infantry. Fate. However, was unkind, for. Save a short tour of duty on Plum Island, the sum mer of 1898 was quite uneventful for the artillerymen, while their brothers in the infantry ranks were winning fame and honors in active service; hence this history cannot include a record of Battery B, much as the writer and the city would be pleased to have it possible. About the Publisher Forgotten Books publishes hundreds of thousands of rare and classic books. Find more at www.forgottenbooks.com This book is a reproduction of an important historical work. Forgotten Books uses state-of-the-art technology to digitally reconstruct the work, preserving the original format whilst repairing imperfections present in the aged copy. In rare cases, an imperfection in the original, such as a blemish or missing page, may be replicated in our edition. We do, however, repair the vast majority of imperfections successfully; any imperfections that remain are intentionally left to preserve the state of such historical works.